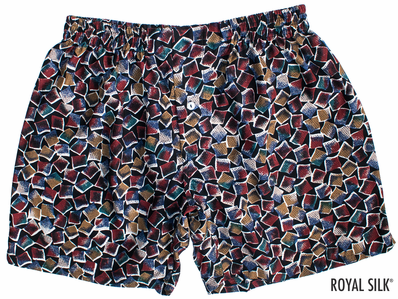 Exhilarating men’s silk boxers by Royal Silk® in a colorful tile pattern featuring enticing hues of buff brown, deep rust, indigo blue, chalk white, and aqua green. Styled in smooth mid-weight Corded Silk that drapes nicely and delivers light, velvety comfort. Waist sizes S (30-32"), M (33-34"), L (35-36"), XL (37-38"), and 2XL (39-40"). 100% Silk. Hand wash or dry clean. 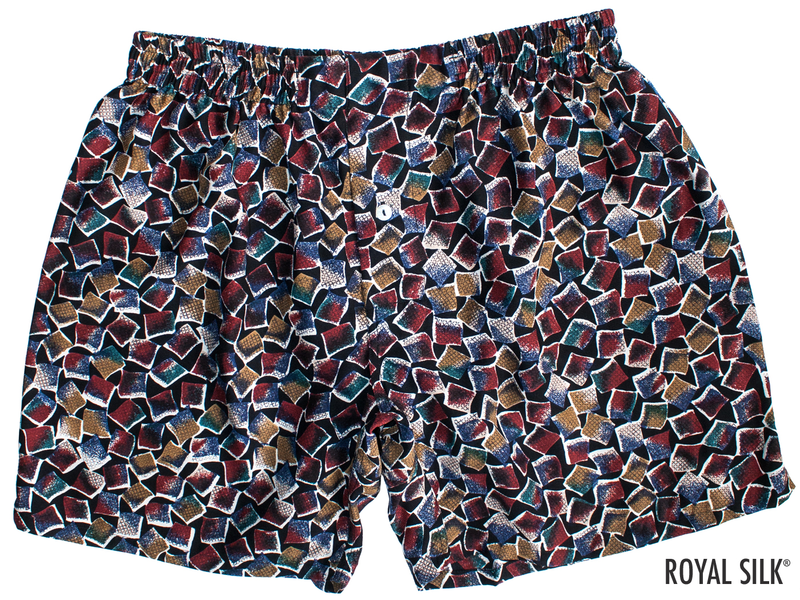 The boxers are full cut with lengths ranging from 16.5" to 17.75" for sizes S to 2XL. Inseams are about 5.5" for all sizes. Three-panel construction allows for roomy comfort. Full-sized fly front with single-button opening. Single-button fly closure features 0.5" mother-of-pearl button. Extra button included. 100% Silk. Imported. Hand wash or dry clean. We include how-to-wash instructions that are quick, easy, and simple. To machine wash, we recommend our fine mesh Washer Bag that is sold separately. $39.